Sheet music: Ira Gershwin, George Gershwin: Strike Up the Band! Ensemble for saxophones and rhythm accompaniment (3 alto saxophones, 2 tenor saxophones, 1 baritone saxophone, electric piano, bass, guitar, and drums). 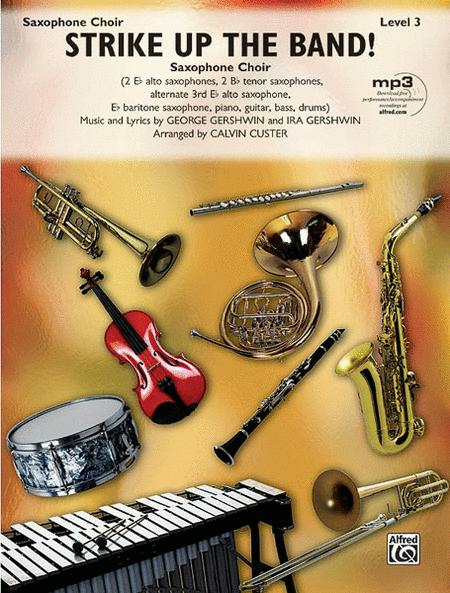 Download free full-performance and accompaniment recordings. Play along with the music and learn the correct style with the full-performance track. The accompaniment track includes only piano, guitar, bass, and drums, so, if you don't have a rhythm section, you can play along with this track in rehearsal and performance.